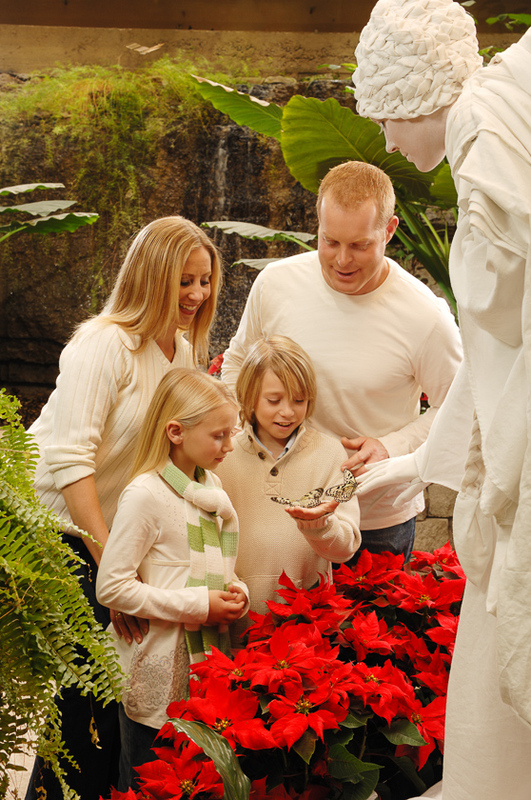 “The Butterfly Palace & Rainforest Adventure‘s White Flight provides Branson with a unique ‘White Christmas,'” said Annette Wood, Director of Sales and Marketing for the Branson Tourism Center “Like Silver Dollar City’s Old Time Christmas, Branson’s live Christmas Shows, and much more, it’s yet another unique Branson Attraction that makes Christmas in Branson so special,” she added. Brittney Smith, the General Manager of the Butterfly Palace & Rainforest Adventure, said that one of the major features of White Flight is a unique exhibit consisting of thousands of white, green, and red butterflies. You will walk in a ‘rain forest’ amid thousands of fluttering butterflies, colorful red and white poinsettias, sparkling lights, and ‘living angel statues’ to the sounds of beautiful Christmas music. She adds that this is the seventh Christmas season for this special, limited engagement exhibit which runs through January 1, 2016. The butterflies in White Flight are comprised of many different tropical species; with the most common being the ‘Paper Kite Butterfly,’ also referred to as the ‘Rice Paper Butterfly.’ As is the case with the most of the butterflies exhibited at the Butterfly Palace, they live out their average three week life span in a predator free environment. They arrive, via air express, from tropical rain forests in their chrysalis (cocoon) stage; after emerging, they’re released into the exhibit in the aviary. Another amazing feature of White Flight is the beautiful and subtle performance of the centuries-old art form of ‘living statues’ in the form of ‘White Angels.’ The statues slowly, and barely perceptibly, coming to life as people approach while butterflies flutter around and alight on them. It might be just a subtle change in the position of a head or the extension of a hand, but it’s fascinating to watch as the living statues interact with the guests. The aviary is decorated with a number of poinsettias and other flowers and highlighted by a large poinsettia Christmas tree, providing an excellent place for picture taking. The whole White Flight experience, from the thousands of White Butterflies to the living angel statues and beautiful music, is a unique experience for the whole family to enjoy. Smith points out that White Flight is in addition to all the other activities offered by the Butterfly Palace & Rainforest Adventure for the enjoyment and entertainment of the whole family. Ongoing features of the attraction include a Living Rainforest Science Center, the Emerald Forest Mirror Maze, a Rainforest Theater, and the Banyan Tree Bungee Adventure. For additional information or tickets for Butterfly Palace & Rainforest Adventure, or any of Branson’s shows and attractions, or for lodging arrangements, please contact the Branson Tourism Center, one of Branson’s largest and most respected vacation planning services by calling 1-800-785-1550, or by visiting www.BransonTourismCenter.com. This entry was posted in General on November 14, 2015 by Gary Groman.